They're coming. Olivier Giroud, the chisel-jawed Bamm-Bamm. Antoine Griezmann, the fair-hired sprite with the Fortnite celebration. And, of course, Kylian Mbappe, the teenage phenom whom none other than Arsene Wenger has already compared to a guy named Pele. Are the guys standing in their way worried? Uruguay have conceded a single goal in four World Cup games thus far. And, as they might be keen to point out, Pepe's header wasn't in an open play, but in a set-piece situation. France might have their attacking superstars past, present and and future, but Uruguay have their own fearsome foursome. Two of them, of course, are longtime acolytes of the ultimate spit-and-gravel coach. Diego Godin and Jose Gimenez have blossomed under Atletico Madrid's Diego Simeone and are the embodiment of "Cholismo," the hard-to-describe, know-it-when-you-see-it, part world-view, part eternal underdog-dom preached by the Argentine. 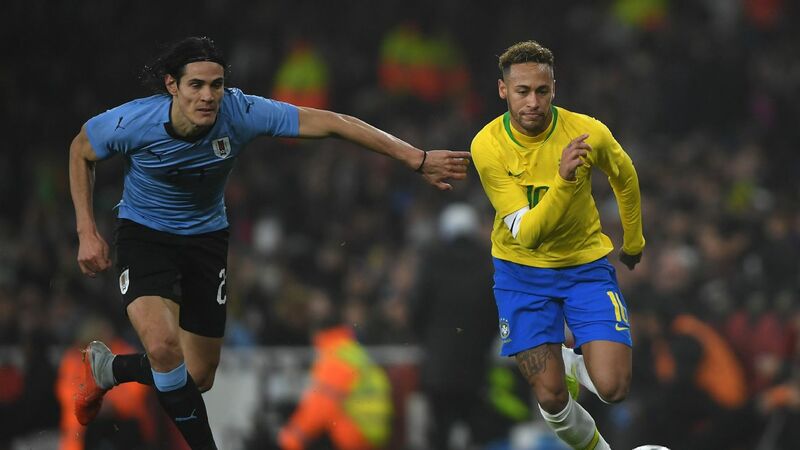 You can debate whether they're the best centre-back pairing left in the World Cup, but you can't debate that playing against them is probably the least fun. It's a classic master and apprentice situation. Godin is the big brother who taught little bro how to hunt. Nine years separate the two. Godin arrived at Atletico in 2010, three seasons before Gimenez, who landed in the Spanish capital when he was just 18, picked up for around a million dollars from Uruguay's Danubio. Atletico left him in the youth side for a year, but not his national team. When you're the size of Uruguay, if you're old enough, you're good enough. And so Gimenez went to the last World Cup despite the fact that he had played just two professional games for Atletico. And when Diego Lugano got injured, Gimenez stepped straight in, keeping his place in the side until Uruguay's exit to Colombia in the round of 16. It's a synergistic relationship. Godin provides the experience, the reading of the game, the seen-it-all-before coolness. Gimenez is the athletic freak blessed with quickness and an NBA-worthy vertical. He's the big dog who only wants to be let off his leash. You'd expect those two to be ready for battle. 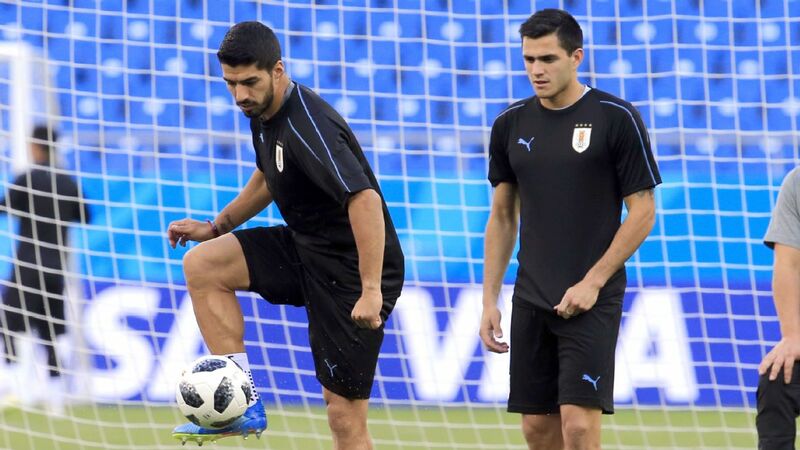 In the circle of life of Uruguayan defensive hard men, the great ones might only come all along every few years or so. Thus, Paolo Montero mentored Lugano, who mentored Godin, who mentors Gimenez. Actually, it's circle of steel, more like. Diego Godin and Jose Maria Gimenez prove the bedrock of Uruguay's impressive back line. But it's the two full-backs and the way they've merged seamlessly into the back line that has been remarkable. Martin Caceres on the right is one of those guys whose career appeared to have ground to halt on multiple occasions. It was around this time 10 years ago that Barcelona bought him for a whopping $20 million (trust me, young'uns, it was a lot of money back then). Caceres was a 20-year-old kid who had spent the previous season finishing dead last in La Liga at Recreativo. Yet scouts were hugely excited by his rare combination of size and speed. He never made the grade at the Camp Nou, and later a combination of injuries, inconsistency, disciplinary issues and being in the wrong place at the wrong time limited his impact at Sevilla and Juventus. Indeed, after being released by Juve in June 2016, he was unattached for the next eight months, before being picked up by Southampton, for whom he made a single, solitary appearance. He spent the past six months at Lazio, making just four starts and, once Uruguay's ride in the World Cup ends, he'll be looking for a new home again. It might seem crazy, but since that season at Recreativo when he was 20, he has played just 150 league matches in 10 seasons. At 31, the clock is ticking. He wants to make every second count, and perhaps that's why he has played this tournament like a man whose rear end is on fire. The quickness that once set him apart is only intermittent these days, but he brings with it a tenacity and an intensity that too often were lacking in his club career. On the other flank, meet Diego Laxalt. Truth be told, he's another guy who really shouldn't be there, and not just because he's more of a winger than a full-back, especially an old-school Uruguayan-style left-back. But despite playing further up the pitch for his club side Genoa, he has more than embraced the role here and has been one of the better left-backs in the tournament. In some ways, he's the guy who could have ended up like Caceres. He was bought by Inter with much fanfare shortly after his 20th birthday but was never given a chance at the Milanese club. He went off on various loans but failed to make his mark. Indeed, in the 2014-15 season -- which he split, on loan, between Empoli and Genoa -- he made just one start. But then he returned to Genoa, first on loan, then on a permanent deal, and in the past three seasons, he has blossomed, albeit mostly as a wide midfielder. With his braids and baby face, he doesn't fit the hard-man stereotype so often associated with Uruguayan defenders. But he can certainly play the part when needed. Because when you join a Uruguayan back four, you become part of a unit, a digit on a balled fist. One that's waiting for those fancy French forwards.